“Bird Table” is a series of paintings inspired by a play on words. 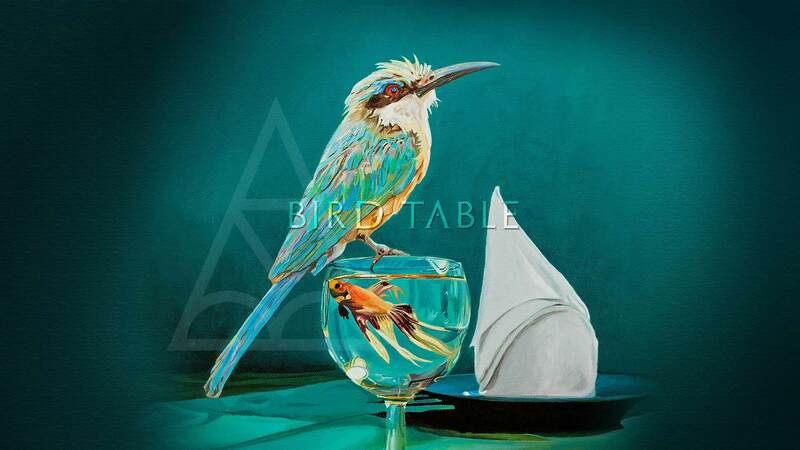 Each painting places different birds inappropriately on diversely appointed tables. The dominant colours express a compelling take on the central theme of beauty and symbolism in close proximity. The birds’ questioning expressions reinforces the ironic nature of the compositions. 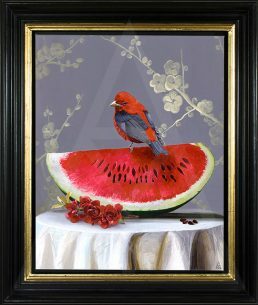 Bird Table 2 – A beautiful red Tanager balances on a slice of ripe watermelon. In the foreground a delicate sprig of cherry blossom, symbolising female beauty, power and dominance, sits on the crisp tablecloth. Watermelon seeds are scattered on the table ready to be planted. The background is a gold Japanese cherry blossom wallpaper design. 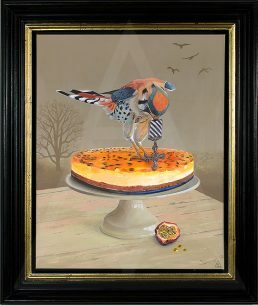 Bird Table 3 – A Kestrel perches on a passion fruit cheesecake proudly clasping a DFC (Distinguished Flying Cross) with his beak. Half a passionfruit lies on the table spilling its seeds. The story is strengthened by the leafless tree and birds that hover in the background. 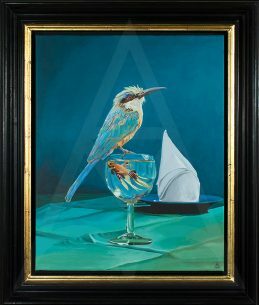 Bird Table 4 – A Bee-Eater clings to the rim of a wineglass that holds a Siamese Fighting Fish. The Bee-Eater looks directly at the viewer while the fish looks up at the bird. The table is in the process of being set for dinner. 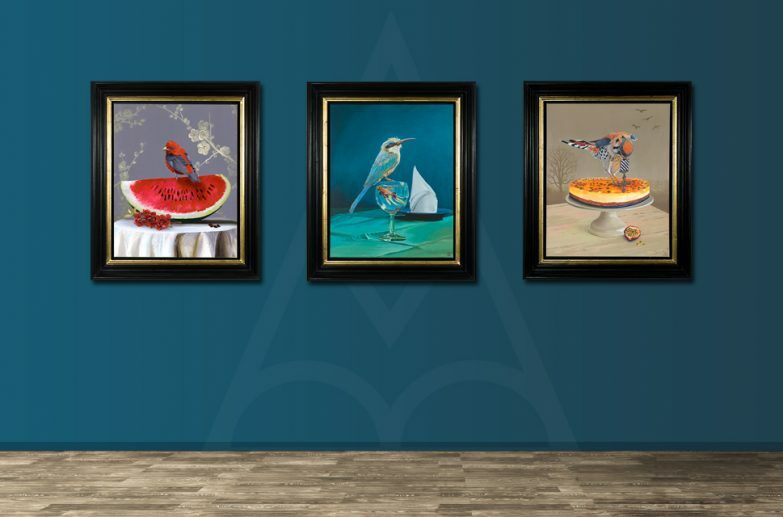 These paintings are exclusive to the Beumée Gallery, Tunbridge Wells.